CONTACT OWNER TO BOOK THIS PROPERTY DIRECTLY: ALYCESTICK@GMAIL.COM OR CALL 610-639-3500. Enjoy your own private retreat at this beautifully renovated 18th century stone home nestled on 100 acres of lush Bucks County countryside. Come for a weekend (three night minimum), a week, a month, or longer. Discounted rates for repeat visits (10% off 2-5 stays, 15% off more than 5 stays, 20% off long-term time-sharing rentals). Rates include all utilities and maintenance. Maximum guests: four overnight; twelve on the property. The surrounding landscape features lawns, gardens, two terraces, an 18th century stone bank barn, smokehouse, springhouse, garage, and other outbuildings. Enjoy the peaceful view from the flagstone terrace adjoining the house, across the lawn overlooking Cooks Creek, a designated Class A exceptional value stream with native and brown trout. Relax by the firepit on the garden terrace, taking in the long view across gardens and pastures. Highlights of the delightfully updated home include its original random-width pine floors, deep-silled windows, and stone walk-in fireplace. Tasteful antique and contemporary furnishings throughout the house create a welcoming and comfortable ambience. Living room and dining room open to the terrace that spans one side of the house overlooking the creek. The bar/library adjoining the living room provides a small refrigerator, sink, and glassware for easy entertaining, as well as shelves of books for your ‘spirited’ enjoyment. The large, eat-in kitchen offers all the necessities for gourmet cooking, a center island, plenty of workspace, and cabinets of china and glassware for every occasion. A cozy TV/sitting room adjoins the kitchen, providing satellite service with a 42" HD screen, high speed Internet/Wifi, Blu-ray player, Sony receiver with AM/FM radio, and double speakers (with the second pair in the living room). A powder room completes the first floor. Upstairs, the master suite is a light and airy private space including bedroom with double bed, decorative fireplace, and sitting area overlooking lawns, garden, pastures and Cooks Creek. Adjoining the bedroom are walk-through closets, bathroom, and a private stairway to the first floor. The master bath has a separate toilet area, glass-walled tile shower, tub, and dual vanity sinks. A second charming bedroom offers a double bed, closet, and views of lawns, garden, pastures and the creek. A third small room is a charming study with a desk and sofa (which converts to a double bed). A full bath with tub/shower is easily accessible to the bedrooms. The main hallway and stairs complete the second floor. The basement provides laundry facilities and a third full bath. Three fireplaces in the house add decorative charm (but are non-working). The property is easily accessible...a 90 minute drive from New York City and 60 minutes from Philadelphia. The property is located on Route 212, two miles west of the Delaware River at Riegelsville, PA, where the beautiful ‘River Road’ (Route 32) branches off Route 611 and follows the river south through quaint Bucks County villages on the way to New Hope (a 45 minute drive). The locale offers the best of several worlds...the natural beauty and peace of an undeveloped, largely conserved rural setting; the quaint Bucks County villages and venues for which the area is so renowned; and the cultural offerings of nearby towns like Bethlehem, Doylestown, and New Hope that are brimming with alluring activities. The Delaware River offers a multitude of opportunities for boating, fishing, and walking or cycling along the scenic canal tow-path. Lovely country inns and restaurants abound for elegant or casual dining. Enjoy scouting the area to visit the numerous art galleries, antiques,crafts and other unique shops. Local farm stands, bakeries, and butcher shops.provide the ideal resources for creating your own farm-to-table feasts. My parents purchased Penbuck Farm before I was born, blessing me with the unparalleled life-long experience, education, and enjoyment of rural Bucks County. The farm was the long-time home of my family’s nationally award-winning herd of pedigreed Ayrshire dairy cattle. The extraordinary natural beauty of the farm and its valley have influenced my life's pursuits, from childhood love of the outdoors to adult avocations of gardening and nature photography. Inheriting this piece of heaven on earth is an extraordinary privilege that I treasure and am pleased to share with those who also appreciate the joys of country life in a very special place. Favorite moments....waking to see the mists rising over Cooks Creek and the meadows beyond...shopping for local culinary treats and cooking up wonderful country meals...walking the farm's totally private paths, fields, and gardens...retreating to the study to write or catch up on email...having lunch on the front terrace overlooking the creek...perusing books in the library and curling up to read in the 'hearth' room...napping in the hammock...watching birds at the feeders...sipping evening drinks with friends around the firepit on the garden terrace, as the deer wander by...sitting down with family to a tantalizing, candlelit dinner...settling into the TV room for a favorite program or a good movie...watching billions of stars in the black night sky...nestling into a cozy bed and dozing off to the faint hoot of a waking owl. toilet, tub, shower, Easily accessible to Bedroom 2 as well as Bedroom 1.
toilet, combination tub/shower, This bathroom is in the basement. toilet, First floor powder room adjacent to the living room. The Master bathroom has a separate toilet area, glass-walled tile shower, tub, and two vanity sinks. 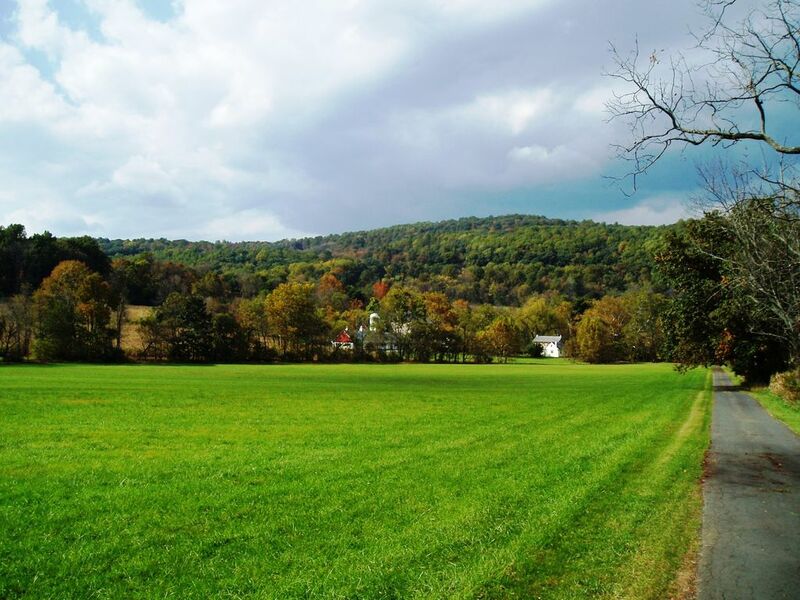 Located on Route 212, in beautiful Durham valley between the Delaware River and Saucon Valley area. Scenic Cooks Creek runs right by the house. Enjoy views from the terrace, walk along the banks, fish for native and brown trout. Stone walk-in fireplace in the living room and smaller fireplaces in the dining room and master bedroom are not working but add to the 18th century charm. The living room is comfortable and attractive, with antiques and contemporary furnishings, art works, and adjoining bar/library. It opens onto a flagstone terrace with umbrella tables and chairs. The large, eat-in kitchen offers all the necessities for gourmet cooking, a center island, and plenty of workspace. Extensive lawns and landscaping, including garden terrace with firepit. Kayak, canoe, and tubing excursions are available on the Delaware River (at nearby Frenchtown). Bicycles can be rented (or bring your own) for scenic excursions along the Delaware River Canal tow-path. Boating and sailing is available on nearby Lake Nockamixon. Bring your own or rent. Flagstone terrace adjoining house with access from living and dining rooms, overlooking Cooks Creek. Skiing is available at Blue Mountain resort, only 28 miles away. Moravian Academy in Bethlehem offers tennis courts to the public, as do numerous other facilities in the area. Bethlehem Golf club boasts an 18 hole championship course designed by William and Dan Gordon, with a 4 star rating from Golf Digest and voted 100 Must Play Courses in the Philadelphia area. Perfect historic house, beautifully decorated and thoroughly outfitted. This house makes me happy. I will return and would move in in a heartbeat. Alice is an inspired collector and decorator, and a helpful host. Alongside all the authentic period charm you will find a luxurious updated master bath and a kitchen equipped for a chef. Love it! This was one of the best vacations ever. So peaceful and relaxing, taking us back in time leaving us yearning for the history of this home, farm and the folks who lived here from the beginning; 1790. Extremely clean and well maintained. What a joy it has been staying here. BEAUTIFUL AND THE NICEST OWNERS! Alyce and her husband were so accommodating, and their property is just immaculate! We had my family and my husbands siblings stay in the home with us, and it was one of the best trips we've had to PA to visit family, and having this home was a big component of it. Everything is so clean and the property is just beautiful! We have so much fun exploring and watching the creek. My 2 year old daughter was with us, and we had to keep a close eye on her because of all the antiques. However, we told Alyce that we had a small child with us, and her and her husband went through the house and made sure all of the easily knocked over items were stored away so we didn't have to worry about that. Everything was great, I do not have one complaint, honestly! Unfortunately, we are not able to come out to PA this Thanksgiving, but most likely we will be coming in 2017 and most likely this is the home we will be renting if it is available. Thank you again! It was our pleasure to have you as caring guests at Penbuck Farm and we hope to welcome you back again next Thanksgiving (or sooner). A group of friends and I spent New Year's here. It is a beautiful well-cared for home. Really lovely property. Owners were responsive and wonderful. Highly recommend. We chose this gorgeous property as a place to gather for a family Thanksgiving celebration. Notwithstanding the difficulties of navigating the Bucks County countryside in a serious snowstorm, we had a very nice experience. Of course, the house and grounds looked like a painting after the snowfall. The house, though quite old, is spotlessly clean and incredibly comfortable. It was well provisioned with clean sheets and towels, and a seemingly never-ending supply of good dishes, silverware and kitchen equipment. The owners have many beautiful things all around the house, and they were incredibly nice about the fact that we moved things around so that nothing would get broken when our Thanksgiving crowd arrived. The electricity went out because of the snow storm, and the owners came to see what help they could provide. Luckily it came back on about an hour later, so the turkey could finish cooking. We would definitely return--perhaps with a smaller crowd. I can imagine that this would be a wonderful place for a summer getaway with friends. It is delightful, as are the owners. The property is located on Route 212, two miles west of the Delaware River at Riegelsville, PA, where the beautiful ‘River Road’ (Route 32) branches off Route 611 and follows the river south through quaint Bucks County villages on the way to New Hope (a 45 minute drive). New York City and Philadelphia are a 1.5 hour drive. Discounted rates for repeat visits (10% off 2-5 stays, 15% off more than 5 stays). 20% OFF LONG TERM TIME-SHARING ARRANGEMENTS. FLEXIBLE DATES. CONTACT OWNER FOR DETAILS. Pay Rates include all utilities, maintenance, and housekeeping service upon departure. Maximum guests: four overnight; twelve on the property.